Can this be "Goodbye" to Summer?? What can I say - any theme based on seasons is going to end up topsy turvy in one part of the planet or another! But I rather enjoyed putting my numbingly cold winter hands to work with some lovely warming colours! I feel warmer just looking at this card! The top layer uses the emboss resist and stamping with an embossing folder techniques. I used versamark to ink up the Lovely Lace embossing folder, placed a piece of Whisper White card stock on top and pressed it evenly with my hands. Then sprinkled with gold embossing powder and applied heat with a heat gun. Then I used sponge daubers to apply ink: Cherry Cobbler at the bottom, Watermelon Wonder in the middle and Crushed Curry at the top. I took a bit of care to blend the colours and wiped the ink off the embossing with a tissue and added a few Candy Dots in Cherry Cobbler and Crushed Curry. I stamped a flower from Birthday Blossoms in Versamark onto the Crushed Curry card stock and heat embossed with gold embossing powder. Then I sponged carefully and lightly with Cherry Cobbler and Watermelon Wonder - fading out towards the ends of the petals. Then I cut out the flower. The little flower is punched from Crushed Curry card stock with an Itty Bitty Accents punch, the centre and edges are sponged with Watermelon Wonder and then I put a Cherry Cobbler Candy Dot in the middle. 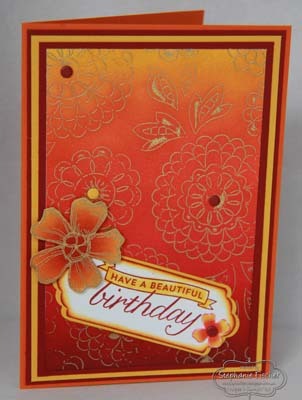 The Sentiment is from Birthday Blossoms and I stamped it onto Whisper White using Cherry Cobbler ink. I sponged Crushed Curry ink into the banner by just using an edge of a sponge dauber. I used the Tags and Labels Framelits to cut the sentiment into a symetrical label using the method I describe in this post. I sponged the edge quite generously with Crushed Curry ink and then added a thinner edge of Cherry Cobbler. Then I made a slightly larger label with Crushed Curry card stock and layered them together before sticking them to the card with dimensionals. The card is made from Watermelon Wonder card stock layered with Cherry Cobbler and Crushed Curry. Do join in the fun - whatever season you're currently experiencing! 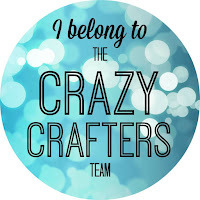 I look forward to seeing your creations at Splitcoaststampers.